Available to U.S. Shipping Addresses Only. 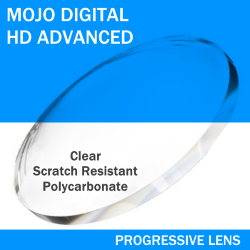 We now offer 6 progressive lenses with various options designed to address presbyopia as well as Computer Vision Syndrome (CVS), glare, and blue light. 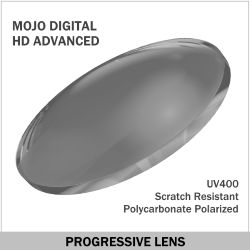 There are different options for each progressive lens type. For best results we recommend consulting with us before purchasing. 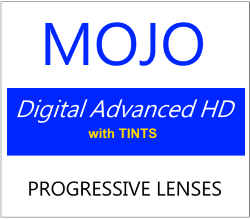 Mojo Digital HD Advanced is our affordable free-form digital progressive. The lenses provide a very wide channel from distance through reading. They are available in polycarbonate clear, with Mojo BluBlock or cosmetic tints, or AR coating. 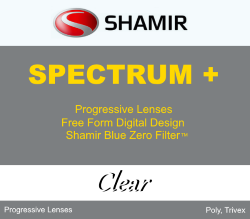 Shamir Spectrum+ progressives have Blue Zero filter. Blue Zero is a clear monomer that filters about 20% of HEV blue light. The Trivex material filters 98% of HEV blue light in the critical 415-435nm range. The Transitions versions filter even more blue light whether you are inside or outdoors. 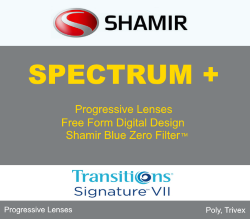 Shamir Spectrum+ is similar to Varilux Comfort DRx but less expensive. AR (anti-reflective) Coatings: We offer several AR coatings including Crizal Prevencia AR which is the best blue block AR coating on the market today. Top quality yet affordable progressive lenses. 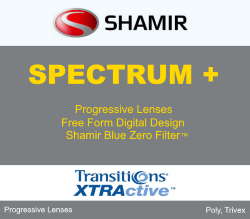 Clear or with Transitions Lenses. Polar Grey, Brown or with Xperio colors. Advanced design with Blue Zero filter. Clear indoors, 70% dark outdoors. Clear indoors, 80% dark outdoors. Add a frame to your cart. Do not select lenses or options. You can order up to 2 frames to try. Go to the lens you want by clicking See This Lens in one of the lenses choices below. Configure the lenses options, Upload your Rx and Add to Cart. Send the frame(s) for you to try on. If you like the frame, take a picture of you wearing it. We will e-mail instruction, it's easy. Once we have the picture we will obtain the fitting measurements. You return the frames with a prepaid shipping label. The frame you don't want will be refunded. By the time we get the frame back the lenses will be ready to process. Total turn-around is about 2 weeks.